Please scroll down to see my post for Day 1 of the Countdown to Confetti New Release. Welcome to the Pretty Pink Posh New Release Blog Hop! are available now at Pretty Pink Posh! If you're following along with the hop, you should have arrived here from Nichol Magouirk's blog. 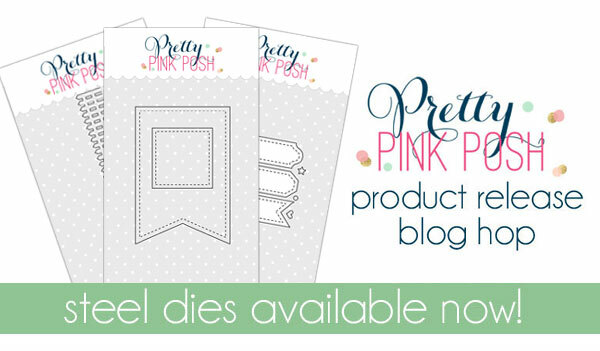 I love Pretty Pink Posh's new picket fence die -- it's so sweet! I started by diecutting my white panel using the Stitched Duos 2 die. Then, I ran it through my diecutting machine a second time with the Picket Fence die. and the grass in simply charteuse. them in front of the fence. and added a flag (diecut with another new Pretty Pink Posh die set -- Stitched Labels 1 dies. Next on the hop is Joni Andaya's blog. there are 2 $25 gift certificates up for grabs. Winners will be picked randomly along the blog hop. That is such a pretty card. I love the soft colors and the wood grain background. I love your take on the sketch and your use of products! So adorable, beautiful and spring like! Love the way you used the picket fence in the middle of the card and did the masking. Beautiful results. Great take on the sketch, Leigh. What a lovely card! This is beautiful! Love those sweet flowers! Love this serene card, Leigh! I love the new fence die ! What a beautiful card and I am off to look for that sentiment from s.s.s. Very pretty, Leigh! Love that little fence die! Such a pretty card! Love how the fence is inset. You have created a lovely card that anyone would want to receive. Thanks for the inspiration. Love the technique to set the fence diecut. So sweet and happy. Love the way you inlaid the the fence then popped up those florals. What a great sentiment and sweet card. Thanks for sharing! Great card, I love that the fence is inset into the background! Beautiful card!! Love the pretty flowers and the fence . This is such a beautiful card! Love everything about it! I love the pretty colors you've used in your card! Adorable! What a pretty comforting card! 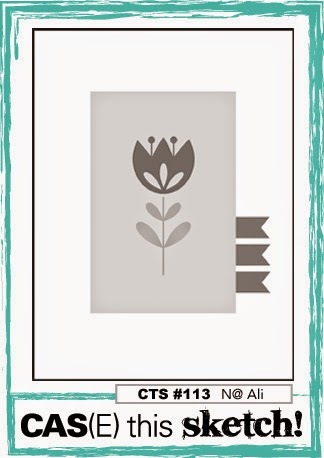 Your card is so fun and cheerful, perfect for spring! Love the use of the new dies, especially the fence! Adorable card!! Love the picket fence inlaid!! This is super cute - love the new dies and the way you used the picket fence is fabulous! What a beautiful card! The fence is a pretty touch. These new dies are fabulous! I love your picket fence! Your card is lovely and I am loving that picket fence! Gorgeous design, love the picket fence die and the way you showcased it!!! I wasn't going to comment on this hop, just look; but this card is so pretty that I had to comment. Beautiful card! Gorgeous design, love the picket fence. That is a gorgeous card! I love the spring colours and your stamping! Love the picket fence and those flowers are just so sweet! This is the prettiest card I've seen in a long time. It's just right for the serious sentiment but it could just as easily be used for other occasions Really nice! Your card is beautiful, and I think I think I am in love with the picket fence die. Wow! What a super cute card! The picket fence die is so tiny a cute! I love it! Such a beautiful spring card! Beautifully done Leigh, love this! beautiful card - luv your design! Gorgeous card, Leigh. Love those new dies. So beautiful! I love the new dies and that sentiment is wonderful. Very pretty card - who doesn't like flowers! The picket fence looks so cool on this card. So beautiful, and very true, that. Lovely card!! Loving the new releases! Wow this card is stunning. Its such a beautiful card. I love how the fence was used. Sigh.... how stunning! Love, love, love everything about this, Leigh! super sweet and beautiful card! This is such a gorgeous card!! Love the inked sky/grass!! My favorite of this release is that picket fence die!! LOVELOVELOVE how you paper pieced the fence into the card! Awesome idea! !I think this is a fabulous card! TFS! Beautiful. I love the the picked fence is die cut from the sky...that looks awesome! Lovely card--I love the way you used the fence die!! what a comforting setting. great card!! This is a beautiful card...loved it from the get go. It really caught my eye. Love this beautiful card design and sentiment. Beautiful and comforting card...love the inlaid fence. I love everything about this card, Leigh. Such a darling scene. Love the sweet scene and beautiful sentiment on this wonderful card! So pretty! Simply gorgeous Leigh! I love the inlaid fence die! Your sky is just beautiful! Nice card and love all of the new release, I’m off to hop!! TFS. Great card. Love the flowers! This is so beautiful, I love this card!!!!! Love that inset fence die cut! What a beautiful card!!! I love the inlaid fence and the flowers are perfect! Leigh, the scene you have created is beautiful! You have used so many dies on this card, and they all work so well together. I've always thought I could create a mask with the PTI clouds but have never done it. Now I know I need to! It looks fabulous on your card. Awesome, awesome card!! What a great design. Love how you "fused" the fence. I love our card! Some lucky recipient will be blessed by it! Awesome card!! Love that fence die cut myself!! Love the picket fence - so many options to use them. So pretty, Leigh! I love your sky and the picket fence scene! LOVE how you have inked and inlaid the fence into your stitched panel, LOVE the pretty flowers too!!! So beautiful Leigh, with a fabulous sentiment! Leigh, this is just beautiful! Love the inlayed die cut fence!! WOW!! LOVE the inlayed fence and the way you created the background. STUNNING!!!! Love the look of the inlaid fence! Love everything about this card, including the masking, soft sponging and laid in fence die cut. Very lovely card! Also nice use of colors and diecutting!!! Love it!!! Aw...such a beautiful card! I'm seriously in love with you card! Great take! I love the scene, the wood grain background, the colors..everything! Perfect! What a sweet scene Leigh. Love the pretty flowers, the fence, the sky... the stitched edge panel looks great. What a lovely and pretty card! This is such a beautiful card !!!!! I love this!!! So adorable!